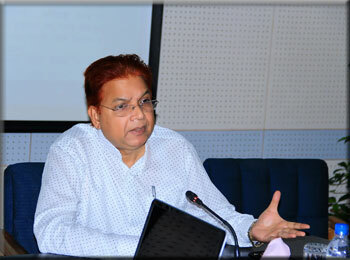 The top officials of Palli Karma-Sahayak Foundation (PKSF) on 24 July 2017 met representatives from 12 NGOs — officially termed as Partner Organisations (POs) — that are operating desalination plants installed in different salinity-hit coastal areas of Bangladesh under the PKSF’s ‘Learning and Innovation Fund to Test New Ideas (LIFT)’ programme. Dr Md Jashim Uddin, Deputy Managing Director (Administration) of the PKSF, chaired the meeting held at PKSF Bhaban in Agargaon, Dhaka. A range of issues including safe water supply situation in the target locations, rationalizing desalination plant technology, operational management and sustainability were discussed in the meeting. The executive directors of different POs and their representatives highlighted the massive response of the people who avail services from the desalination plants run by his organization. “People are highly appreciative of the low-cost services we provide. Sometimes, our plants are operated at capacity to meet the demand,” said one of them. They, however, stressed the need for providing training to the plant operators so that they can fix minor technical glitches without wasting time for bringing technicians from as far as Dhaka. One of the PO representatives spoke on the challenges regarding improvement of distribution channels, and ensuring sustainability of the interventions by building community ownership. The InM is currently conducting a study titled ‘Innovative Solutions to Sustaining Access to Safe Drinking Water’, for which they will survey the desalination plants installed by the PKSF. Dr Mujeri also discussed about different aspects of the study with the PO representatives. Highlighting the PKSF’s strive to serve the distressed, the underprivileged and the extreme poor of the country, Dr Md Jashim Uddin urged the POs to ensure that the safe water interventions made by the PKSF operate not for profit, but to serve those in need. AQM Golam Mawla and Dr Sharif Ahmed Chowdhury, both general managers (programme), and other PKSF officials concerned were present at the meeting. The PKSF has so far installed 51 desalination plants, 20 of them under the LIFT programme, in the coastal areas where climate change-induced salinity ingress has created an acute dearth of freshwater. The water from the plants are sold at a minimum service charge, usually ranging between Tk 0.10 and Tk 0.50 per litre, to cover the operational cost only. 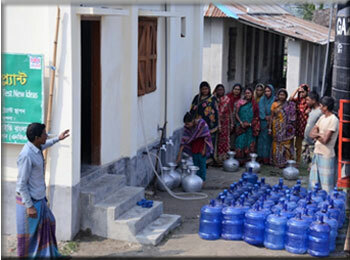 However, the extreme poor and physically incapacitated people are provided the desalinated water free of cost.